Paper Poseables: Gupp-E - Made with Poplocks! 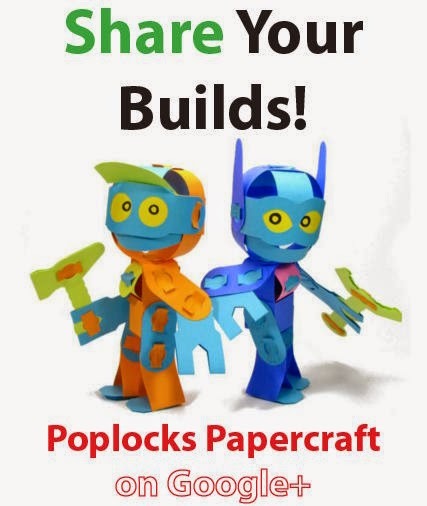 These are the Gupp-E robots, paper toys made with a new paper technology -- POPLOCKS! You can attach parts together without glue. The connections are strong and the friction is formidable! Poplocks are the invention of myself and Alexander Gwynne. Read a whole bunch more about them on the Poplocks Page. In short, overlap the holes on two pieces of paper, and pop in a Poplock. You now have a freely rotatable connection and it stays together! I'm selling Poplock toys and you can buy them! Visit my Store at Big Cartel to purchase colorful, perforated, pre-cut parts and receive them in the mail. Pop out the parts and glue a few together. Download a free Poplocks Sampler. This gives you everything you need to print out and assemble basic Poplocks for no cost beyond materials and your time. It's not a toy kit, but it does give you the chance to make normal connections and the stronger kind of attachment that Locking Flaps offer. You'll get a feel for how they work, and you can also adapt these shapes into your own paper toy designs. Keep checking the Poplocks Page on this site for more goodies! Download the Gupp-E Assembly Instructions PDF and get more pictures of how it all goes together. And check out these pics! You can combine Gupp-E parts in many different ways! Gupp-E is just the first released Poplock toy. Wait till you see what else Poplocks can do! You are a gentleman, and quite scholarly. Thank you! My first Gupp-E came out great! I 'm the guy that freaked when the parts sheets arrived folded. Never fear! Josh planned the pages so that creases in the sheets line up with creases that are a natural part of the design! Hope you got my e-mail, Josh.